Today saw the last round of the Conway Trophy for I0M yachts and the end of the club's 'racing season'. The weather forecasts suggested that we would go out with a big blow: B suit wind from the North East and sun all morning. Well we had all those elements but not all morning: it was chilly to start with until the sun finally appeared late in the morning; the wind was vaguely from the N/E and saw three of us launch with A rigs while Mike Stevens and Richard arrived with B rigs fitted, having trusted the weather forecasts. The A suits ruled the water until the wind eventually rose to a point where a break was taken to allow them to change down after which things were a bit more even. It was Mike Ewart's turn to have 'one of those mornings' when his jib rigging let go in race 2: he missed race 3 while jury rigging it back in place after which it didn't really perform as it should; the change to B rig must have come as a relief. Rob Tottey and Mike K. shared all the 1st places and most of the 2nds with Mike Stevens getting a couple after everyone was in B rigs. We sailed a simple 'Triangle and Sausage' course starting between White 2 & 3, heading out to White 6 and then Red 3 before taking Red 1 to port and heading back to the windward mark, returning to Red 1 and finishing across the line between White 2 & 3. The beat was slightly lopsided at times but gave many opportunities to make up, and lose, places and the windward mark was not a place to be trifled with. The wind was confused up there and the safest way was to be positive, even if one over-stood it by some distance: the wing mark also caused a few problems with some wasting a lot of time over-standing it by a 'mile' while, on other occasions, skippers tried to get close to it and found themselves sailing inside it and having to 'unwind' their bit of string to go around the correct side. An unofficial 'agreement' saw us continue sailing until one o'clock: we managed one after 12 race and then 'the lady gave up' - the starter battery had run down - so we packed up after a very pleasant morning's sailing. This event did not take place, it rained again. A warm Sunday morning saw just four of us gather at Furzton Lake, others away at competitions or just having better things to do. The wind being from our backs it was seen best to sail from Pauls Spit, John Howell set the course, after one unsatisfactory attempt, it was decided to take a running start, with the line being between a point on the bank and red 5 in the bay, out to a mark directly across the lake from the spit, port to a spreader then back towards the bay and round Red 5 back across to the windward mark then back to finish across a line the other side of Red 5. We had light winds with stops, starts and holes, much as normal for Two Islands. John was a gentleman, allowing each of the other three to win one race, allowing himself only ten wins from thirteen starts. I see also than John’s good fortune continued after he left us to watch Watford Vs Tottenham. It did rain, but this didn’t put us real men off! A southerly wind so a bit of a strange start from the far western start marks up to the red 5 by the spit, out to a far leeward mark towards the hotel (I couldn’t see the number) back to red 5 repeat with the finish just off of the western launch platform. It was Sunday morning, there was still enough water in the lake, there was noticeable wind - for a change - and it was largely from one direction, though not what was forecast. For the first race we decided, due to apparent lack of wind to our left, to have a running start between orange 2 and white 4 out to white 8, beating back to white 1, diverting to orange 5 on the way back to white 1, another trip to white 1 and back to white 8 then back to finish between o2 and w4. Although this gave some challenging windward legs the arrival of the 'pack' at white 8 first time was not an experience we wanted to repeat. From race 2 we reverted to a more traditional dash from the orange 2 / white 4 line to orange 1, to our left, out to orange 5 and down to white 8; thereafter the 'sausage' between white 8, white 1, and back to white 8 and on to the finish between o2 / w 4. This resulted in some close sailing, often just a touch too close followed by an occasional penalty turn being taken. The morning saw a mixture of fortunes, some good and some 'not-so-good', a degree of 'boat fiddling' between races, and one or two more "where am I going wrong?" questions vocalised. The top three emerged after a morning of ups and downs, with Keith C. having fewer downs than David A. who, in turn, had fewer downs than Mike K. Rob Tottey put his Britpop across the line first in the only race not claimed by the top three and newcomer - to the club - Andy Harrold claimed one of the second places up for grabs. There were only two 'bouy catches' this morning, Geoff Raygada caught white 8 during the first race and Mike Ewart managed to park his yacht on one of the outer orange marks during the last race. Unlike Geoff, Mike hooked an 'obstruction' not a 'mark of the course': it doesn't really matter as the result was the same, a DNF score. Sunday morning at Furzton was wet(ish), sadly not enough to raise the water level enough to stop a number of unexpected 'groundings' just far enough out into the lake to make retrieval awkward. The wind was from the South, I think, but appeared to come from all over from the general direction of the car park. It was strong enough for all but one of us to carry the 'B' rig so we could maintain a degree of control when the significant gusts hit. At times, particularly at the windward mark - Red 8 in the right hand bay - where rounding was very like what we have experienced at other marks recently. On a number of occasions it was only the momentum of the One Metre yacht that carried one into and around the mark. The only yacht carrying 'A' rig was that of our newest member, so new that many will not know his name, Stephen Wheeler was on his inaugural race session with his nicely planked 'Lion' design called Leo. Showing us all up at times Stephen's yacht carried the full area with poise, never appearing to be out of shape: maybe there is something in those more wholesome yachts of the early part of the century. Our other new member sailing with us today, Tim Prince, had his early BritPop well in the mix all morning except for race 9 where he fell foul of a bouy anchor line on the last beat to the finish. The course was a little unconventional with a start between marks 4 and 2 just off the left hand platform after which we set off on a starboard tack/close reach towards Red 8 in the bay. The start line was chosen because it was just about the only line between two bouys that could be sighted and provide a chance for the bunch to get away cleanly - sort of. Looking at it in isolation one would say that there was only one place to start, bang on the nearest mark - 2 - but that was absolutely no guarantee of getting to the first mark first once the wind played its part: indeed I can think of only one race where it was achieved - by me - on every other, it was someone else who came out of the first mark first, having started a bit further down the line. From Red 8 we went to White 8 out in the lake and, sometimes, the real wind followed by a decidely dodgy beat back to Red 8 after which we went out to White 8 again and returned to finish between Red 8 and a marker on the bank down beyond the life belt. With vagaries of the wind on every leg places changed all over and many finshes were closely called happenings. A challenging morning but, as they say, it was the same for everyone. Those that stayed at home in the dry missed a quite reasonable morning of sailing which was observed and 'phone-pictured by another potential member who wanted to see I0M sailing before making his final decision on what boat to acquire; I think he was impressed. Seven I0M skippers turned out today for a chat in the sun: Oh, and we also managed to complete 8 races in another example of how the wind on our sailing area differs from the forecasts. At times it was vaguely from the forecast North Easterly direction, in between it whispered from pretty much every other direction. This made completing the course which started between white 2 and 3 and used the white 6 (the left hand one) as nominal windward mark somewhat tricky. It then proceeded to the grey topped orange mark, recent sailors on the lake will now which one I mean, and down to Orange 1. This all port rounding course was repeated for a second lap before finishing between orange 2 and white 4. We stuck to this course all morning even though, at times, it would have been more conventional to just sail in the opposite direct from the start. Numerous skippers set off from the start in a leading position but it was almost always one, John Howell, who led the fleet across the finish line. There were several collective losses of decorum at the windward mark as skippers struggled to cope with the minimal but very shifty wind conditions at that end of the course and, at one time or another, we all got involved in the mayhem. Never the less it was a very pleasant way of passing the morning in the sun. The finish of most races did resemble a procession and there weren't too many opportunities to make up places on the beat, nor on the off wind legs, but positions did change in most of the races so it is not surprising that, behind John, scores were pretty close. Keith and Richard both completed the morning on 20 points, after discards, but Keith gets the place by virtue of his two second places to Richard's one. There were some amusing incidents during sailing like the time when Mike E. called that he would be giving mark room to Mike but not to Mike: it must have sounded strange to others, but we knew what he mean't. 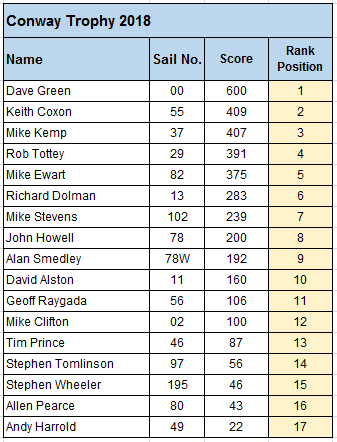 Please find attached the results of Sunday's I0M outing courtesy of Mike Stevens who reports that 'going was slow'! The first race took 45 minutes, which must be some kind of record; of perseverence at least. As you can see only four turned out to sail. Nice to see Mike Clifton sailing at our water again, and John C. came along later to watch."